If you’re selling generic products like boxes of candy or bottles of wine, designing an effective point of purchase display is a relatively straightforward process – you measure the product, size the shelves and add some eye-catching graphics. But what if you’re selling laminate flooring, or wetsuits or kitchen sinks? You might be thinking that it would be best to invest your marketing dollars in some high-quality brochures or catalogues, but this will probably prove to be ineffective. Pictures can only go so far and customers are more likely to be enticed to buy products when they can see and feel the quality themselves, particularly when making an expensive purchase. So what’s the solution? Pick up the phone and talk to the experts. Avante Manufacturing have been designing and manufacturing permanent POP displays for more than 25 years and we’ve seen it all. Below are few examples of some of the more unusual products that we have create displays for. We use actual samples of your products and/or packing to value engineer displays to exactly fit the products you are wanting to showcase. We use creative techniques to add reinforcement to support heavy products, while still maintaining a flat-pack, easy assembly set up. We can incorporate media players into your display to explain the features and benefits of your products, if this isn’t evident. All of our design and manufacturing is done in one location, which means that we can test your displays throughout each level of the process and make tweaks where necessary, ensuring your end product meets the highest standards. What you need to remember is that all of our displays are custom designed and as such, can be as elaborate or a simple as you need them to be. No matter what your product, we can work with you to create something unique and eye-catching, that can be easily placed in retail locations. Usually the word custom often translates to expensive, but even our more unusual displays are surprisingly cost effective. We ensure that design and manufacturing costs remain proportional to the total $ value of the products being showcased – e.g. it would be counter productive to have a $400 display showcasing $200 worth of merchandise. 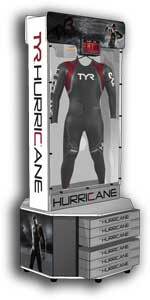 Your investment will also be protected because your display will feature some form of permanent branding. This prevents display hi-jacking and increases the chances of re-orders as the display empties. Unique and interesting displays are more likely to become a permanent fixture in the retail environment, allowing you to amortize the cost of your displays over a longer time period. If you are struggling with how to effectively showcase your product line (unusual or not) please contact Avante – we have the solution. 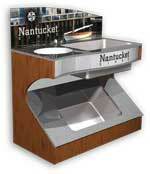 We can display anything including the kitchen sink!